First of all, I want to thank everyone for their lovely comments about my good news - the support and good will from the online sewing community is truly amazing! And lest you think that I am resting on my laurels, here is my latest project. Although I certainly do not NEED a new coat, I had a hankering to cut into some lovely wool coating last week, so I did. I have been trying to find the right fabric for this pattern for years. Of course, as soon as I cut into the wool fabric, I wanted my new coat. Does this happen to anyone else? I have so many different ideas for so many projects that I will never have enough time to finish them all, which makes me impatient to finish whatever I am working on. 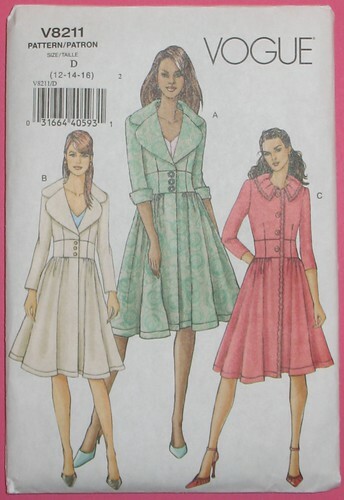 Once I have my pattern and fabric, I want to wear my new creation! 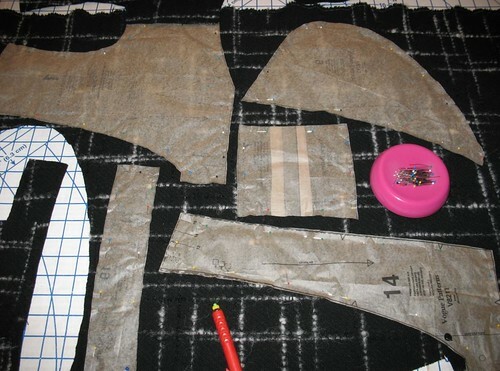 But I took a deep breath, stepped back, and decided that I was going to make this coat the right way. After all, I waited five years for the right fabric, and it deserves the few extra hours it will take to make the coat last a lifetime. I am underlining the wool coating with cotton flannel. 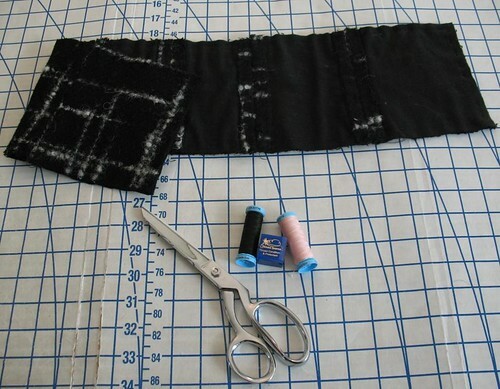 Because of the added bulk, once I press open the seams, I am catch-stitching them to the flannel underlining. 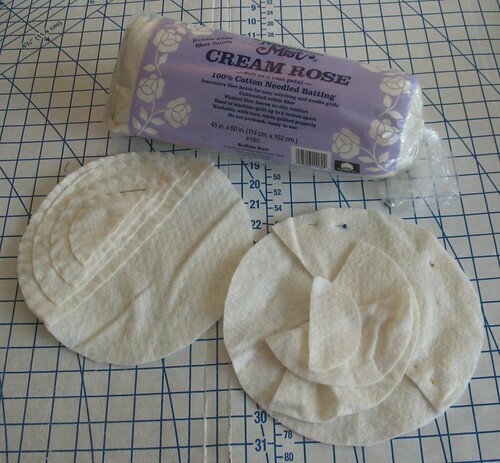 Turns out, this makes it so much easier to match seams! The collar and facing pieces are getting underlined with plain black cotton. I may add cuffs to the long sleeved version, but I am not sure about that yet. The coat instructions use purchased shoulder pads. I prefer to make my own, and thanks to my collection of Vintage Vogue reproductions, I have plenty of pattern pieces to choose from! I ended up borrowing the shoulder pad pattern pieces from this dress. I was not sure about a lining fabric, until I realized that my pink satin was the only suitable yardage in my stash that was three yards long. 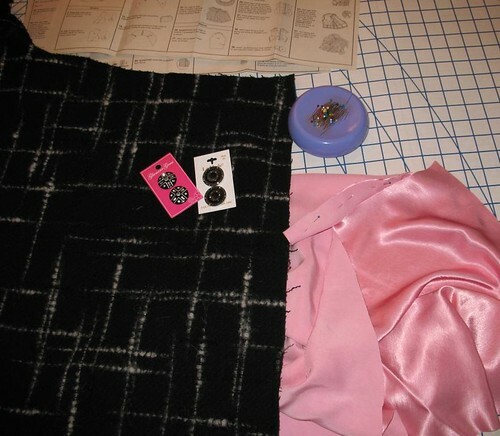 I believe that I am going to be very happy with my color choice – the pale pink and black work great together. Hmm . 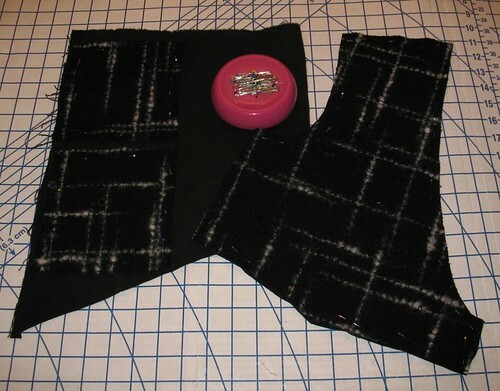 . . maybe I need to make a black dress with pink accents to match . . .
Oooh I love that pattern! I can't wait to see your finished product! Gorgeous fabric choices! It is going to be a beauty. I agree. This coat will be smashing. Loving the pink lining. I have that pattern, too, but haven't made it yet. I was a bit worried about the skirt being too gathered. I'll be looking forward to seeing yours finished! And, I love your pink lining. You must be really handy. I prefer buying my Wool Coats. I just bought ones from Burlington Coat Factory for myself and my daughter. They had great prices and they look much better than anything I could ever make.